Dave Allen finished up his high school career at Rochester's Greece Athena with a statewide honor. Allen pitched well enough in 1987 to be named the Gatorade New York State Player of the Year for his athletic and academic performance and for his character. Allen went on from high school to turn pro. His pro career lasted five seasons. He couldn't translate his high school success to the pro ranks. He never made AA. Allen's career began that year in 1987, signed by the Phillies as a amateur free agent out of the Greece Athena High School in Western New York. Allen played his first year at short-season Utica. He got into five games, giving up one earned in 9.2 innings of work. He then moved to short-season Batavia for 1988, but got into only one disastrous game. He gave up eight earned, getting only two outs. Allen then moved to the Astros system, playing 1989 in the rookie Gulf Coast League. Over 13 relief outings, he had a 5.13 ERA. He returned to the New York-Penn League for 1990 at Auburn. He got into 14 games in relief, and had a 4.02 ERA. He also recorded three saves. His final year in affiliated ball came in 1991 at single-A Burlington. Over 27 games, 18 starts, Allen went 5-7, with a 5.22 mark. 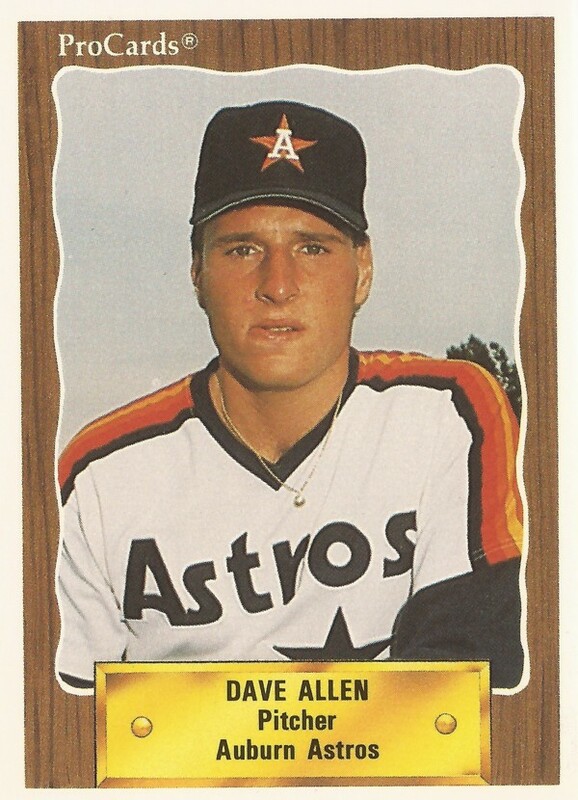 Allen's final pro time came in 1994 and 1995 in independent ball. He got into one game at Winnipeg in 1994 and five at Richmond, Ind., in 1995, ending his career.